Read more profiles of students in Emory's Class of 2016, including graduating students from each of the nine schools that make up the University. 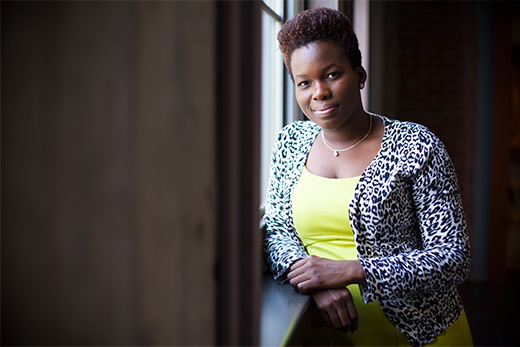 Sanemba “Aya” Fanny discovered her passion for medicine at her mother’s pharmacy in Abidjan, Cote d’Ivoire, but the 2016 Emory School of Medicine student faced a difficult journey from Africa to Atlanta. Fanny spent her childhood in West Africa but civil war forced her and her mother to flee. In 2004, the family’s home was ransacked and Fanny’s school was burned during political riots. After several months of continued unrest in Cote d’Ivoire, Fanny and her mother filed for asylum in the United States and spent the next 10 years in New York. During that time, Fanny continued to thrive in the classroom and went on to attend Vassar College for her undergraduate studies. There she earned her bachelor’s degree in biology. Fanny’s love for medicine and especially working with children led her to Emory University’s School of Medicine and the Rollins School of Public Health, where on May 9, she will graduate with her MD and MPH degrees. During her first year, she was one of four clinic coordinators for two student-run free clinics for homeless men and women in downtown Atlanta. “We worked with faculty to provide basic primary care to our homeless patients on a weekly basis and also organized a homelessness and health care week in the School of Medicine to raise awareness about barriers to health care in this vulnerable population,” she says. Fanny also worked as part of the Familias Saludables student group during her third year at Emory, helping to start a nutrition and exercise program for Latino children and families at risk of obesity. “The most influential service opportunity in my medical school career was the Albert Schweitzer Medical Student Fellowship in Tropical Medicine,” Fanny says. The Albert Schweitzer Fellowship aims to prepare the next generation of professionals who will serve and empower vulnerable people to live healthier lives and create healthier communities. In the summer of 2014, Fanny was one of four students nationwide selected to pursue a three-month clinical fellowship at the historic Albert Schweitzer Hospital in Lambaréné, Gabon. “I left Lambaréné knowing that I wanted to dedicate the rest of my life to reducing those inequities through a career in medicine and global health,” she says. Upon graduation from Emory, Fanny plans to complete her residency in pediatric global health at Baylor College of Medicine. She has also remained in touch with family members in Cote d’Ivoire, visiting them once each year. “My first memories of wanting to be a medical doctor revolve around seeing my mother educate her customers — many of whom did not know how to read or write — on how to properly take their medications,” she says. In her hometown of Abidjan, it is common for people who can’t afford to go to a doctor’s office to visit a pharmacy for health advice and medications.